There’s no question that the Mario Kart’s AI is a big cheater. Anyone who plays the game has probably noticed how the computer-controlled racers tend to catch up to you no matter what and always have an item in hand during the race’s final moments. But what advantages, exactly, do the robot racers get in comparison to their human opponents? 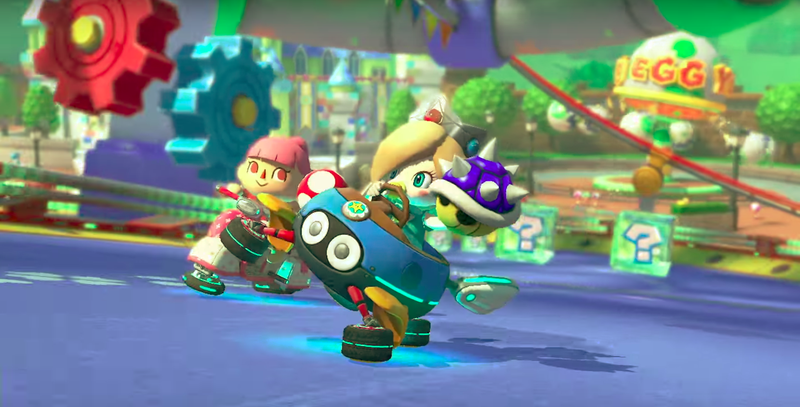 The question has become relevant once more with the new Mario Kart 8 Deluxe for the Switch, in which the artificial intelligence appears to have snapped the rules of fair play in two. Or it could all be a matter of psychology, as some experts have argued. I’ve been trying to unlock every last vehicle and accessory in Deluxe. As I plowed through, I played against a lot of AI competitors. As I played, I planned to earn all three stars for every single prize cup in every level, which you can only achieve through first-place finishes. Here’s the thing, though: that Mario Kart AI really doesn’t want a lowly human like me to place first. I mean, sure, human competitors don’t want me to win, either. But, I swear, the AI racers in Mario Kart 8 Deluxe appear to ignore the other AI drivers and save their items just for me. I’ve seen robot racers hold onto a red shell for ages, only to toss it my way as soon as I finally try to pass them. Back in the 1990s and early 2000s, people who played Mario Kart 64 and Mario Kart: Double Dash noticed that the AI had the ability to speed up after falling far behind. It was easy to spot this “rubber-band” effect in action in those games. More recent Mario Karts have gotten more subtle about providing a helping hand to AI racers. When Mario Kart 8 came out for the Wii U in 2014, some players noticed that the AI was using classic shortcuts on tracks. A computer controlled Mario or Bowser or whoever would use a speed boost right before cutting across a grassy inlet. Human players have done this for years, but AI racers never seemed “smart” enough to do it before MK8. The computer’s speed varies based on how fast the human player goes at the outset of the race. That seems only fair, though, right? If you were a bad player, you’d be grateful for the AI’s “rubber-band” speed alterations, since it would allow you to catch up and feel like a contender. As usual with Mario Kart, item drops in MK8D become less and less useful the longer you stay in the first position. You’ll pick up a lot of low-value items like coins and bananas. Every now and then, you’ll get the best defensive item of all: the Super Horn, which can knock out a Blue Shell if you time it right. MK8D brings back two legacy items from earlier in the series: the Cape Feather and the Boo. That pesky little ghost is a great get for your opponents, because the Boo can steal items. If you’re in first, you might have to waste your Super Horn on an incoming Boo, thereby leaving yourself open to a shell takedown. If you’re doing well, you’re not supposed to get these items, but guess who does get these items when you’re doing well? Perhaps, as a human player, I’m biased against robot racers because I feel like they’ve got a one-up on me. The higher in speed you go in Mario Kart 8 Deluxe, the more petty the AI gets and the luckier it seems to get with items. It’s easy enough to place first in every 50cc and 100cc level and clean up plenty of stars and coins in the process, although the AI’s anti-human opportunism will still stick out to you in these early tracks. The 150cc tracks, however? You’ll have to get mighty clever in order to beat the AI in those stages. You’ll hit the final few turns before crossing the third lap’s finish line and, somehow, the second-place AI rival will have a Boo and a shell. As soon as you get knocked back to second, you’re screwed, because every other AI next in line has also been saving their items for you, and as soon as you’re in striking distance, they deploy the shell onslaught. It’s as though the robot racers know that there’s just one human in the running and they’ve got it in for her. Nintendo didn’t respond to my asking if the item distribution in MK8D offers any advantage to the AI racers. I have no proof that my AI rival “always” gets the Lightning Strike, the Boo, and/or a shell in the final lap. And perhaps it’s just my imagination, anyway. Perhaps, as a human player, I’m biased against robot racers because I feel like they’ve got a one-up on me. Could it all be in my mind? If a human competitor in Mario Kart gets an amazing item, I chalk that up to the game’s internal probability and I blame myself for not having a more precise banana-throwing accuracy. But if the computer gets great items? Well, that feels like the game is “cheating.” The computer is part of the game! It has more information than I do! The AI Mario has a car phone with a direct line to Nintendo and he can get any item he wants! Even if that’s true, it’s a delicate balance to strike. If the AI’s items are too good, then the game swings back to feeling unfair again. I want to feel challenged, sure, but I don’t want to feel like earning three stars in each race is impossible. I rewatched several of my replays to find more definitive proof that the AI players tend to gang up on me. I can only observe what the robots do when they’re close to me, but you know what? They totally hate me. They aim their items at me whenever possible. However, I did notice one instance when AI players too far down the track to identify lobbed shells at one another. So I guess the robots do fight when I’m not in shooting distance, but if they can see me, they do all they can to take me out. But let’s look at it from the robot’s perspective, shall we? I’m an unfair opponent myself! I have the ability to drag a banana behind me or save a Super Horn for the perfect moment. I’ve got those killer benefits that come with being human: creativity and unpredictability. Philip Tan, creative director for the MIT Game Lab, described this phenomenon to Compete as an example of how “players can do things against AI that AI can’t do to players, and players don’t consider that ‘cheating.’” Although the AI has become increasingly human—like since Mario Kart 8, having gained more drifting and shortcut capabilities—the robot racers still can’t match my cleverness with counter-items and blocking. If they could, then perhaps they wouldn’t need the extra Boo and Lightning Bolt drops. Not that I can prove they’re getting more Boos and Lightning Bolts, because I can’t, but come on. They totally are. Tan also remarked that “players rarely notice when AI racers attack other AI racers,” which my own experiences have borne out. I’ve listed plenty of moments here when the AI racers seemed to gang up on me, but the rest of the time, I pay them no mind because I’m focused on my own strategies and racing. I only notice the AI behavior when it affects me. Above all, I remember the times that the AI felt “unfair” the most. Those moments stick out the most in my mind. I don’t think about all the races that I won with no trouble. After all, those races were perfectly fair.